On Saturday, April 24, Business and Professional Women of North Carolina celebrated the fiftieth anniversary of their headquarters building in Carrboro. 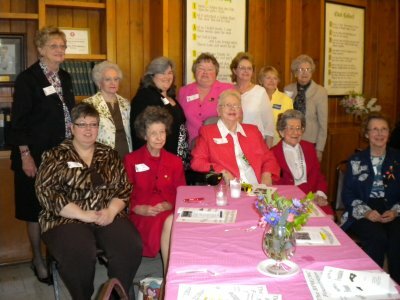 In this picture of the BPW NC past presidents, you see Tar Heel branch member Michelle Evans (seated, far left) and AAUW honorary life member and Raleigh/Wake County branch member Lois Frazier (seated, second from right). Tar Heel branch member, BPW Triangle member, and AAUW NC past president Nancy Shoemaker attended. She brought congratulations from AAUW NC and handed out twenty copies of the new AAUW report, Why so Few? Women in Science, Technology, Engineering, and Math and additional copies of the research summary. This entry was posted in News and tagged membership, programs. Bookmark the permalink. Congratulations to all of you on a job well done!! What a great track record you have had all these years.